Cross-posted on the Google LatLong Blog. 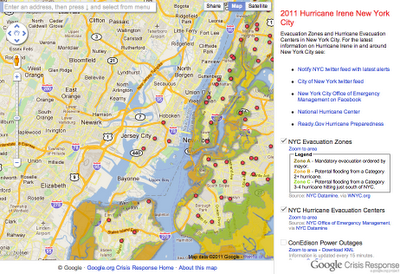 Yesterday, we posted about our new Google Crisis Map, with the latest available geographic information on current disasters including Hurricane Irene. This morning, we put together a New York specific Crisis Map for Hurricane Irene, including Evacuation Zones, Shelter, and Storm Tracking. Sources include NYC Datamine, FEMA, American Red Cross and other organizations. We hope this information helps you stay informed and be prepared.